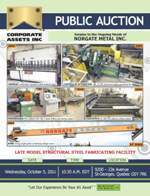 Corporate Assets Inc. | Norgate Metal Inc. - Corporate Assets Inc. FEATURING: PEDDINGHAUS (2010) PCD 1100/3C ATC CNC I beam drilling and sawing system, CONTROLLED AUTOMATION (2006) ABL 74 CNC structural angle processing line, CONTROLLED AUTOMATION (1999) BFC-522 CNC beam punch line, MACHITECH (2006) GC 200 CNC plasma cutting system, GINGRAS (2005) SPB-10-160 combination hydraulic press brake & shear, HYD-MECH (1999) M-20A automatic horizontal band saw, HYD MECH (1999) S-20 horizontal band saw, KONE (2004) 10 ton, 87' single girder underslung bridge crane, ECL 5 ton, 87' single girder underslung bridge crane, CATERPILLAR GP25K 5000 lbs. LPG forklift, PEDDINGHAUS N0.1 100 ton hydraulic ironworker, KAO MING (1989) KMR-700DS 3’ radial arm drill, ATLAS COPCO (2007) GA 22 tank mounted 30 HP rotary air compressor, OTTAWA (1999) C 50 yard spotter, LOADMAX triaxle gooseneck trailer, CURTIS FACTOR (2008) tandem axle flatbed trailer.